You need at least two adapters to make connection. It is easy to setup, just plug first powerline network adapter into an available electrical socket and connect it to your router or computer using Ethernet cable. 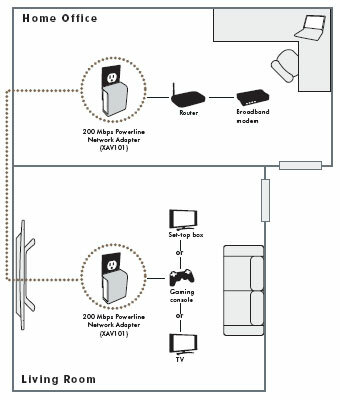 Plug another adapter into electrical socket too and connect it to device you want to network using Ethernet cable such Xbox 360, Playsation 3 and many more. How about security? There is powerline network adapter come with security example Netgear XAV101 support 128-bit AES encryption. Many networking vendor have launched their product for powerline network, try to browse and compare their price and ability through Amazon. You can choose the best for you after see some review and I hope that adapter will help you to make comfortable home networking. Related Post "Powerline Network Adapter"